Tabriz and Mahram will play in final after dramatic semifinals clashes. Both teams posted wins in fifth games to win the series at 3-2. Shahrdari Tabriz edged Naft Abadan 99-92 after overtime. Jourdan Demuynck (198-G-90, college: Prairie View A&M) top-scored for the winners with 32 points and Hrvoje Puljko (193-G-83, agency: Mansfield and Associates) poured in 21. Steven Burtt (189-G-84, college: Iona) answered with massive 45 points in the losing effort. Naft was leading 81-82 till last second but 1 free throw by Asghar Kardoust led them to overtime. 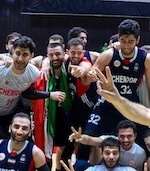 Mahram overcame Petrochemi in a road game 94-106. Jacob Pullen (184-PG-89, college: Kansas St.) stepped up with 30 points and Arnett Moultrie (208-F/C-90, college: Mississippi St., agency: Interperformances) notched 27. Gani Lawal (206-F/C-88, college: Georgia Tech, agency: Octagon Europe) scored 29 in a loss and Dominique Jones (193-G-88, college: S.Florida) added 30. Petrochimi and Naft Abadan played the final games Last year but they lost 2-3 in the semi-final this season. Mahram started the season with young local players and added Pullen and Moultrie for play-off games.